The Chain Conveyor a reliable means of conveying flow able material horizontally with intermediate discharge. Hunter manufactures this product in capacity from 100 BPH to 70,000 BPH. Head Section is designed with a Pillow block bearings and UHMW seals. 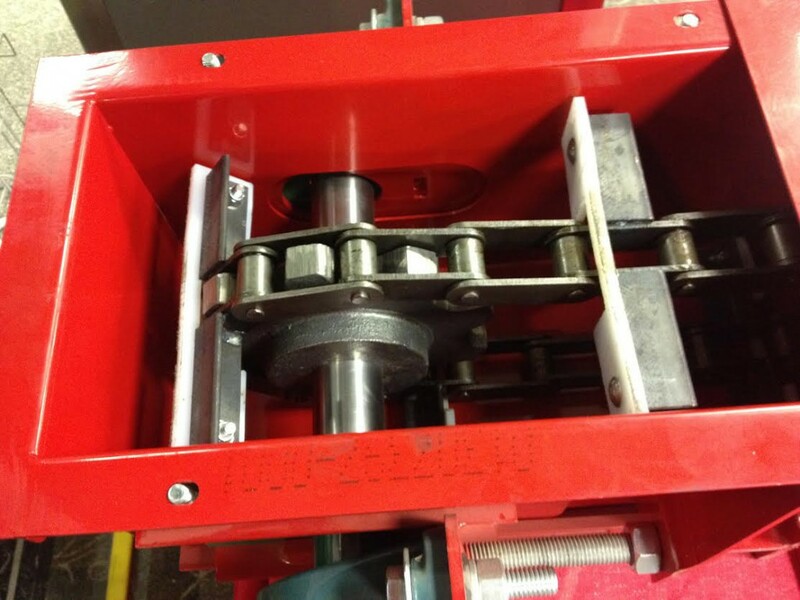 Available options are include; split sprockets, plug switches, chain slack detectors, take-up at the head section. Conveyor Trough is available in two configurations one-piece, or three piece. Each can be lined with AR in various thicknesses either only on the bottom or on the bottom and up the sides. This liner is available in AR of Stainless Steel ¾ or fully lined to the top flange. We offer the option of either return rollers or return rails. Tail Section is designed with a Pillow block bearings and UHMW seals. Available options include but not limited to; split sprockets, chain slack detectors, Self-Cleaning Curved Tails or take-up at the tail section. Low profile En-Masse conveyor is a low and wide conveyor designed to be put in locations where a standard narrow and tall conveyor cannot fit. Comes standard with return cups and return rails.